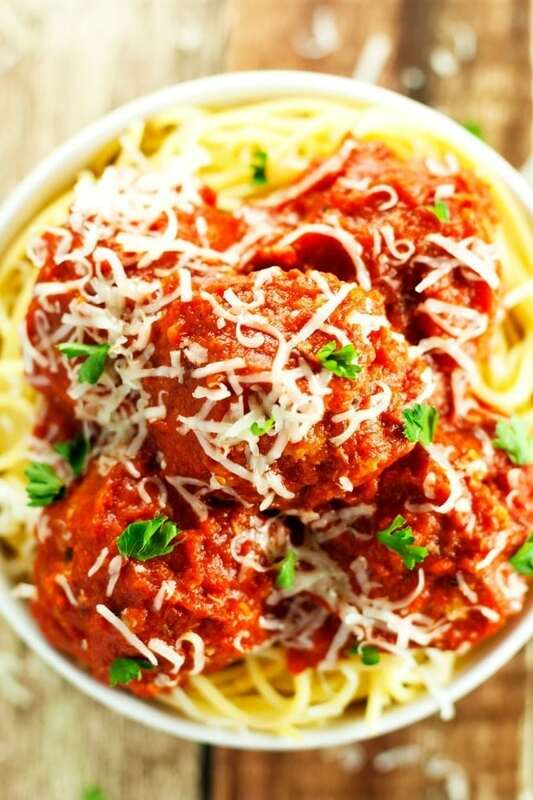 Baked turkey meatballs, smothered in tomato sauce and topped with parmesan cheese. Serve over pasta for a complete, easy, and healthy dinner recipe. Meatballs may be the most fun of all weeknight family dinners. How many other songs do you know that star a food item? But even the most fun meals need a bit a of twist now and then to liven things up. An easy way to put a spin on meatballs is to swap out the ground beef for ground turkey. You could probably use that time-tested, tomato-sauce stained recipe in your cupboard with this simple swap, but here’s my favorite way to make baked turkey meatballs. I know, I know, traditional Italian meatballs are ground beef not turkey. But trust me, these herbs and spices work just as well with turkey. Karen’s fun fact of the day: turkey’s, like tomatoes, are native to the Americas. So, anyway, back to the baked turkey meatball recipe. I use parsley and thyme to add a bit of earthiness to the meatballs, while basil and oregano highlight the sweet flavor of the tomatoes. The Kitchn has a great guide to spices. I’d really love someone to make a fun printable version that I can tape to my spice-cabinet door! (Spice-cabinet is the fancy name for the plastic bin that I use to hold my mess of spice jars). 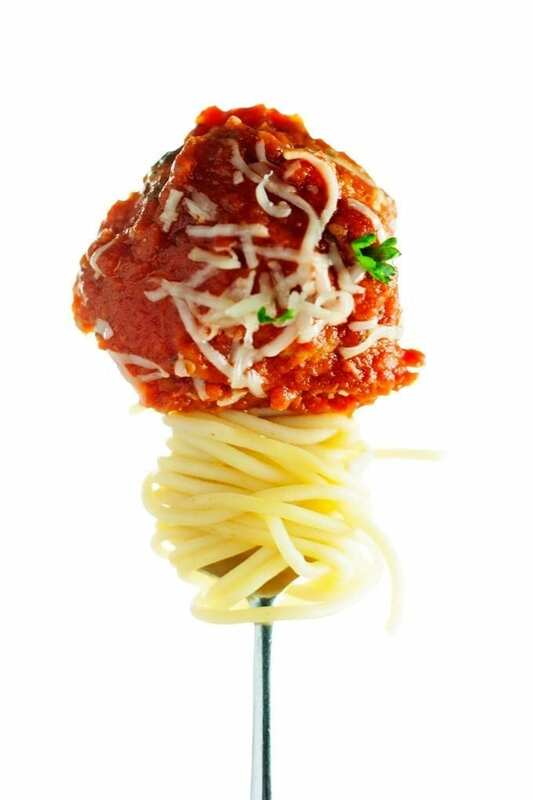 Here’s an easy tip to make all your meatballs moist. Come to terms with using breadcrumbs. They are your friends. Drown the breadcrumbs in milk for 5 minutes (so maybe not close friends). This creates a panade, which is simply a paste made out of milk and bread. Combine panade with ground meat mixture. 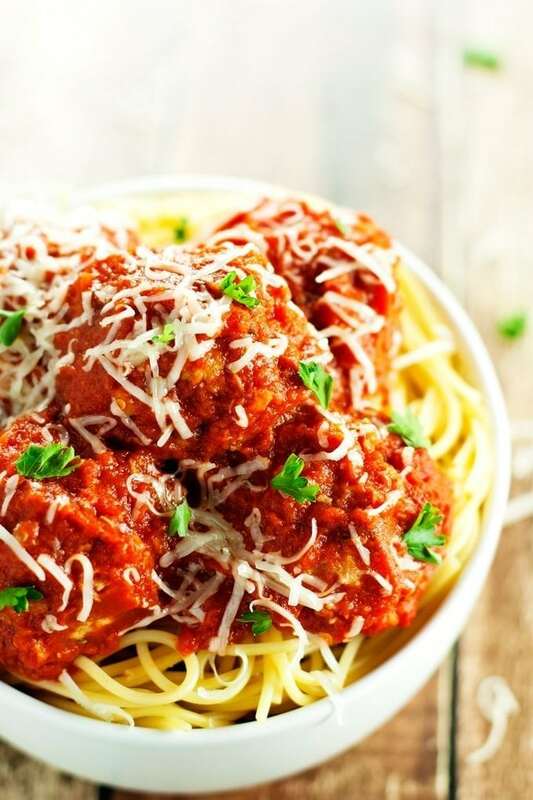 While the meatballs bake, make up a story about how your meatball recipe was perfected in a small Italian village in the 1500’s and was passed to your family only as a way of saying thank you for your great-great-great grandparent’s heroic deed. Tell your story over dinner. Never mention breadcrumbs. Easy, right? 😉 The panade is also delicious in all other types of meatballs, meatleaf, and even some burger recipes (see steps 4-5 above). Seriously though, panades work really, really well. I think meatballs are already pretty healthy, especially since these are baked and not fried. If you are still looking to trim a few calories, I recommend dropping the pasta in favor of spaghetti-shaped vegetables. Check out these spiralized zucchini noodles over at best recipe box for some delicious-looking zucchini spaghetti noodles. I use this spiralizer attachment for my standmixer — makes a great gift for yourself, any food fanatic, yourself. Feel free to use a jar of your favorite sauce on these meatballs, I promise it will be delicous (again see steps 4-5 above). If I have time, I like to make a quick tomato sauce, so I can make the amount of salt, sugar, and spices perfect for me (sorry Chris!). Actually, not sorry. I also like to top the meatballs with a little extra cheese and herbs. Because why not? 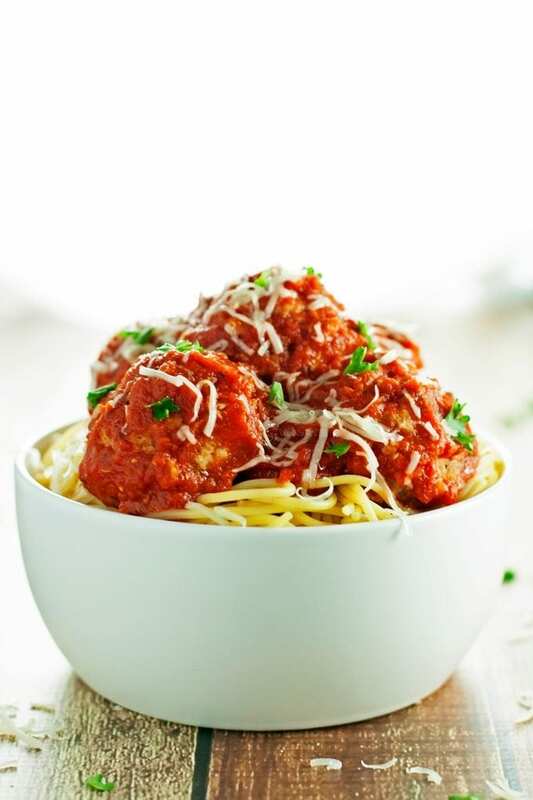 Juicy baked turkey meatballs, smothered in tomato sauce and topped with parmesan cheese. Serve over pasta for a complete, easy, healthy dinner recipe. Preheat oven to 450 degrees Grease a 9x13 baking dish and set aside. Mix breadcrumbs and milk in a large bowl. Let sit for 5 minutes. Crumble ground turkey over milk and bread crumbs. Add egg, spices, salt and pepper. Mix ingredients together with hands. 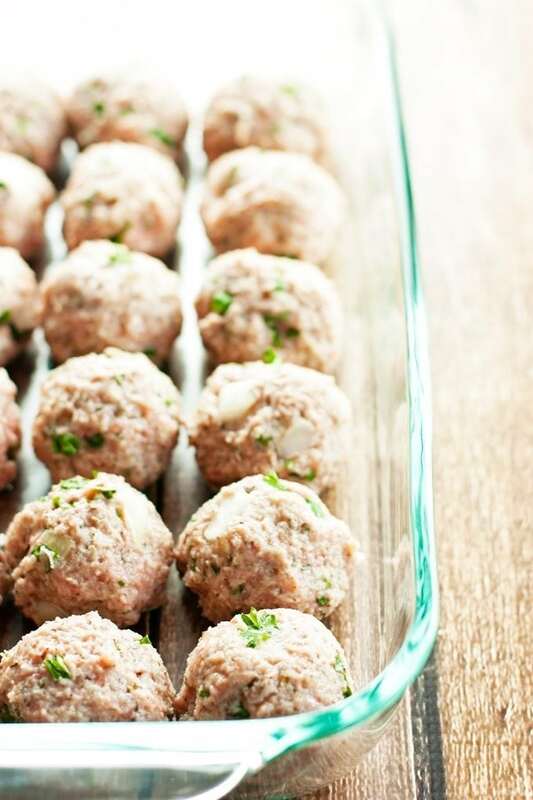 Form into 2 tablespoons sized balls (I made about 20 turkey meatballs) and arrange on the prepared baking dish. Bake until the meatballs are crisp on the outside, about 25 minutes. The inside will not be fully cooked yet. In a medium bowl make sauce by combining tomatoes, garlic, olive oil, and salt and pepper. 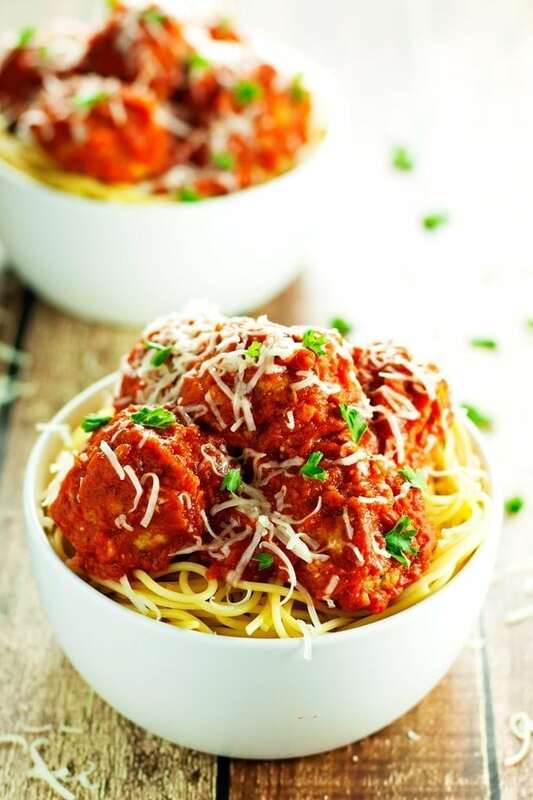 Once meatballs are browned (end of previous step) pour sauce over meatballs, cover dish with aluminum foil and continue baking until meatballs are fully cooked, about 30 minutes. Serve over cooked spaghetti, top with herbs and parmesan cheese, and enjoy! *You can substitute 3 tablespoons of dried Italian seasoning instead of parsley, oregano, basil, and thyme. Some of the links above are affiliate links, which pay me a small commission at no extra cost to you! I love how easy these are to prep and make. Our fridge is usually always stocked with ground turkey so I’m sure these will be making an appearance soon. I do love these meatballs. I may have to start keeping ground turkey around too. Happy New Year!